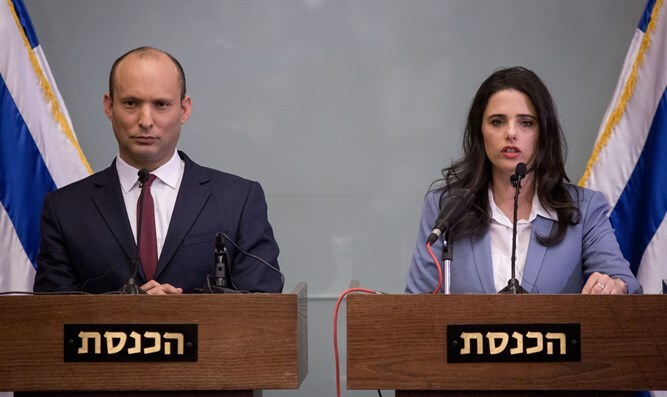 Education Minister Naftali Bennett wrote a message of encouragement to the religious Zionist community in Israel on Monday following the surprise announcement that he and Justice Minister Ayelet Shaked were leaving the Jewish Home party to form their own political party. On Saturday night we embarked a tremendous journey towards the national leadership of the State of Israel. We established a party which brings the people together: traditional, secular, religious, and ultra-Orthodox. The Jewish nation. A party with clear right-wing positions, and full of hope and optimism. In the days since our announcement of the establishment of the Yamin HeHadash Party, we have received thousands of messages from all across Israel. "Finally, a right that unites secular and religious people with a common national Zionist outlook - lead the State of Israel!" These reactions came from the secular and traditional public (and surprisingly, a lot of ultra-Orthodox), eager to join the movement, as well as Religious Zionists who are supporting us and this new process. However, some of the Religious Zionist community have asked difficult questions. Question: Why did you establish the new party at all? What was wrong with Bayit Yehudi? Answer: Everything was excellent in Bayit Yehudi. More than ever. This is a different issue. To connect the people of Israel: religious, secular, ultra-Orthodox and traditional. one nation. I ran for the head of Bayit Yehudi, which then held 3 seats in Knesset, and the wonderful community joined us. We were received with great love. I was elected as party leader and Ayelet, a secular woman from Tel Aviv, was elected at the top of the list by virtue of her character and values. We united with the National Union, and received 12 Knesset seats. Something new had begun. Over time, we wanted to open the ranks to a non-religious public as well. We tried repeatedly and again. Yet they did not come. Over the years we have realized that there are two very important goals here, but they are not always mutually inclusive. The first goal, is national influence and leadership. The second goal, is to address the needs of the religious public and to take a brave and clear stand on its (very different and varied) positions. Time and again these goals collided, and indeed we went down to 8 seats, but more than that, from the point of view of the Israeli public, we returned to the niche of a "religious party." Despite the fact that we persevered to work on all the issues impacting Israel: security, law, and education. And despite the tremendous achievements of all the MKs and ministers, non-religious people simply did not join us. All our attempts to open this up simply did not succeed. Because the truth is that there is a need for two different parties: One is a religious party that respects the needs of Religious Zionism and its ideological nucleus. A party that can also save lost votes that run to parties like Eli Yishai and others. This is Bayit Yehudi/Tkuma. The second is a party for the Israeli people, all of Israel, of a secular-religious, right-wing partnership that connects the people, respects the values of Judaism, and stands as an iron wall on the principles of the right. HaYamin HeHadash. Question: Is this not opportunism? Answer: On the contrary. We are taking a great personal risk, for the sake of a great vision. we decided to go for the right thing. Unite the people, and, also, aim to lead the entire State of Israel. Question: Okay. Understood. Your intentions are good. But do you not split the right-wing bloc? Do you not remember the "Trauma of 92"? Answer: Quite the opposite, we are preventing the trauma of 2019 that could happen. We are increasing the right bloc by 8-10 seats. This is backed up by in-depth research. 1. Lost votes at the heart of the right wing: People who support "Otzma", Eli Yishai, Moshe Feiglin and others who do not pass the threshold. These voters were not willing to vote for Bayit Yehudi in its present form. Sometimes, we were not sufficiently "orthodox" for them, and that's fine. As such, Bayit Yehudi/Tkuma will be able to save 4-5 "lost" seats. Right-wing and right of center voters, who are not religious but feel they have no home in the Likud, for a variety of reasons. They erode away and continue to disappear into three left-wing parties masquerading as right-wing: Lapid, Ganz, and Orly Levy. We are talking about 4-6 right-wing seats that we are losing. This trend is liable only to increase. The new right-wing party, HaYemin HeHadash, is their natural home. And we could save 5-6 seats there alone. Ultimately, the right-wing bloc has fallen to 58 seats, and with our emergence in the arena, 8-10 seats will be gradually added to the right-wing bloc. It should also be said clearly: If this party had existed 13 years ago, Gush Katif would not have been destroyed. Religious Zionism would not have stood alone against the bulldozers of Arik Sharon and the Likud. As a person who grew up and raised his children in the Religious Zionist community, who was a member and counsellor in Bnei Akiva, who served in the Sayeret Matkal commando unit alongside secular and religious soldiers, who ran a high-tech company with secular and religious Jews, I see in this process as the realization of all the values on which I was raised. To stand up and serve the entire Jewish people. I appeal today to all the people of Israel, to join me and Ayelet Shaked, on this exciting Zionist journey.